You don’t need to be celebrating a special occasion to enjoy a private party on the water! 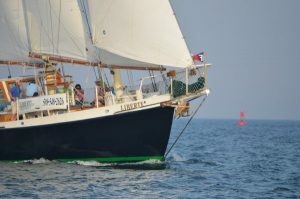 What better way to kick off your summer than with a beautiful sail in Cape Cod aboard The Liberté? You don’t need to be celebrating a special occasion to enjoy a private party on the water! Let The Liberté be your perfect venue on the waters of Cape Cod, and create a special memory be that your friends will remember for many years to come. As you enjoy your sail along the coast of Cape Cod on The Liberté, you can enjoy a great summer day with your closest friends and family while enjoying beautiful views, fun music, and great company on the water. Who Will be Sharing Your Day with You? Because The Liberté can hold up to 49 people, you can have plenty of guests while still keeping your sail a fun and intimate day on the water. Whether you plan to invite friends, family, or even both, there is plenty of room to enjoy the day with the most important people in your life. Create a lasting memory on the water by sharing this unique sailing experience together with the beautiful sights and landmarks of Cape Cod. The summertime availability of The Liberté in Cape Cod allows you to pick a warm summer date for your exciting charter on the water. While summer weather remains relatively consistent, it is also important to consider that rain may affect your ability to enjoy your sail fully. Although you may not necessarily be forced to cancel your sail, it is important to consider that your sail may be more enjoyable on with sunny weather and a warm breeze. What Will You Bring Along? Guests are always welcome to bring favorite homemade foods along for a sail, as long as the food is appropriately stored and transported without glass containers that may be dangerous during your sail. The Liberté also offers a fully stocked bar for you and your guests to enjoy on your sail as you explore the waters and historical attractions of Cape Cod while enjoying your summer day on the water. Celebrate Your summer in Cape Cod Aboard The Liberté! This entry was posted on Friday, July 13th, 2018 at 11:37 am. Both comments and pings are currently closed.